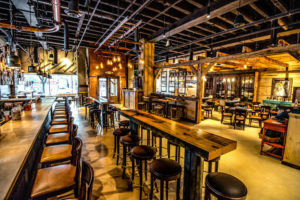 Copperwood Tavern – eating my way through Charm City! I have a really good friend (who helped with this post) who loves brunch just about as much as I do. She lives in Va., so this accidental foodie took a slight detour to D.C. Well, Shirlington Village in Arlington, VA to be exact. Shirlington is a happening place on the weekend – so I recommend reservations. We arrived at Copperwood Tavern and found the inside atmosphere to be warm and inviting. It is a farm to table restaurant, proudly sourcing their ingredients from local farms, well except for the coffee, which was from Brazil (am I sensing another detour?). There is a rustic farmhouse vibe with the recycled wood tables and a wall full of tree stump rings of all different sizes. There outside seating option that is bright and more contemporary, but the spring breeze was a bit chilly for us. A little birdie told me that they have house-made treats for those pups who also lucky enough to brunch. 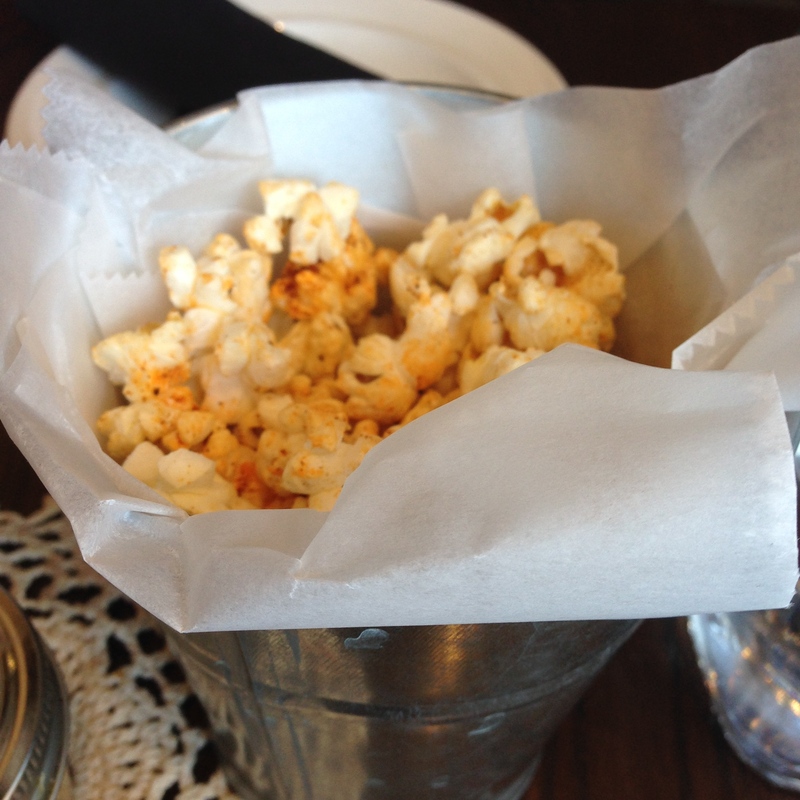 This cute place also uses cloth doilies for bev naps – which add to the woodsy cabin energy.We were immediately served ice water in Mason jars and a tin bucket of spicy fresh-popped popcorn. Our waiter was friendly, quick, and attentive, but not overly so. More importantly, he kept my coffee cup filled. 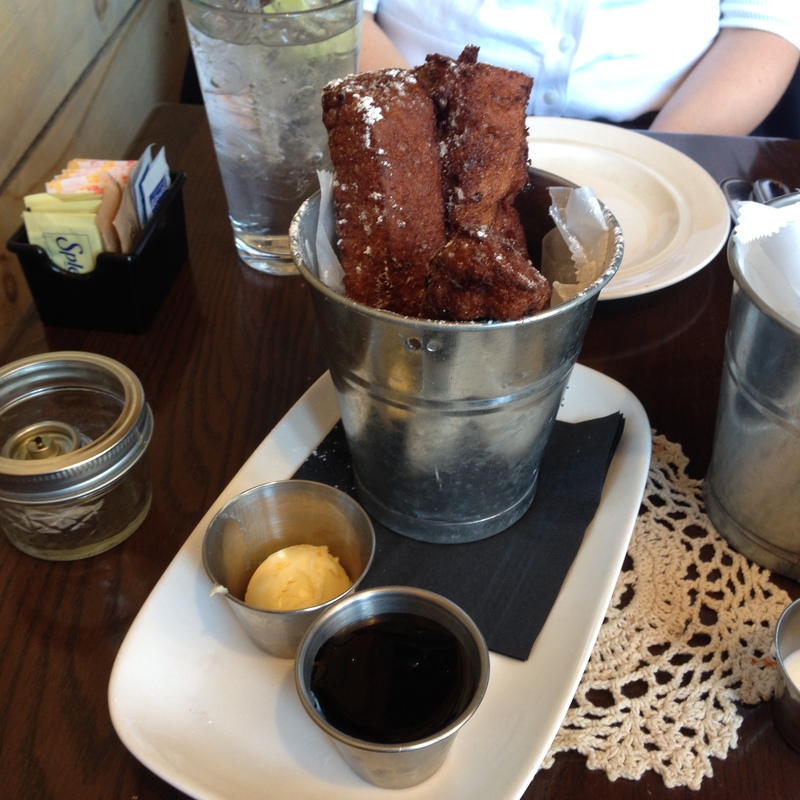 We ordered the French toast sticks as a starter…Yum! This was thick cut of cinnamonly sweet bread served with honey & orange infused butter and then topped with syrup. Talk about starting the meal off right. Especially, since I am a fan of finding ways to add a little sweet to a savory breakfast. But most importantly, let me tell you about the Eggs Benedict. They have about 7 different inciting styles, all served with duck fat potatoes (they do have alternatives, if that’s not your thing). The options were enticing that I missed the friend chicken and waffles. We opted for the smoked salmon and the Cajun style. 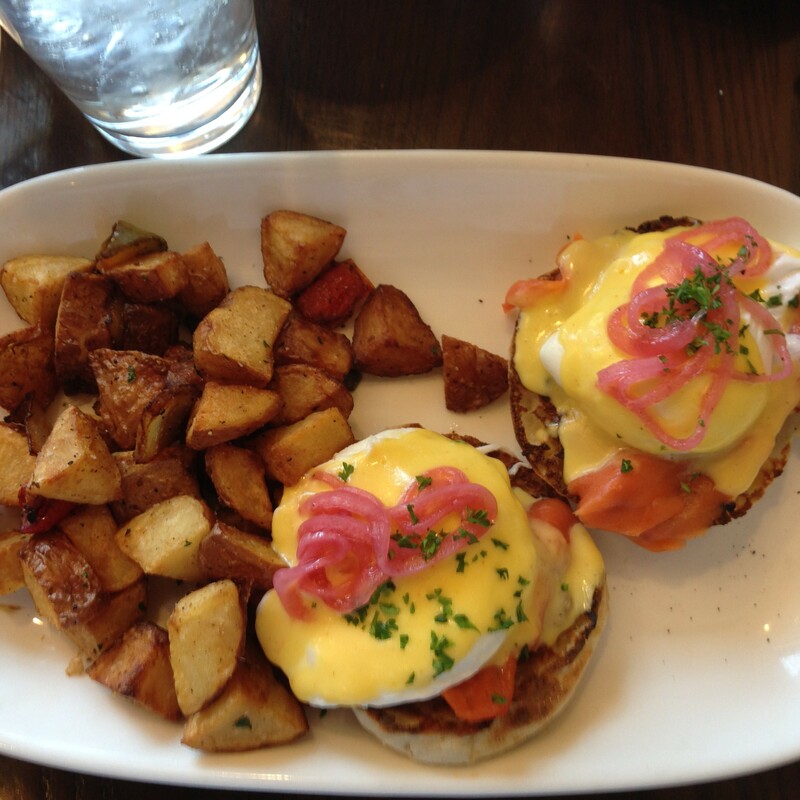 The generous portions of tasty pickled red onions on top of the wonderfully poached egg and the right amount of smoked salmon made for a great combination. 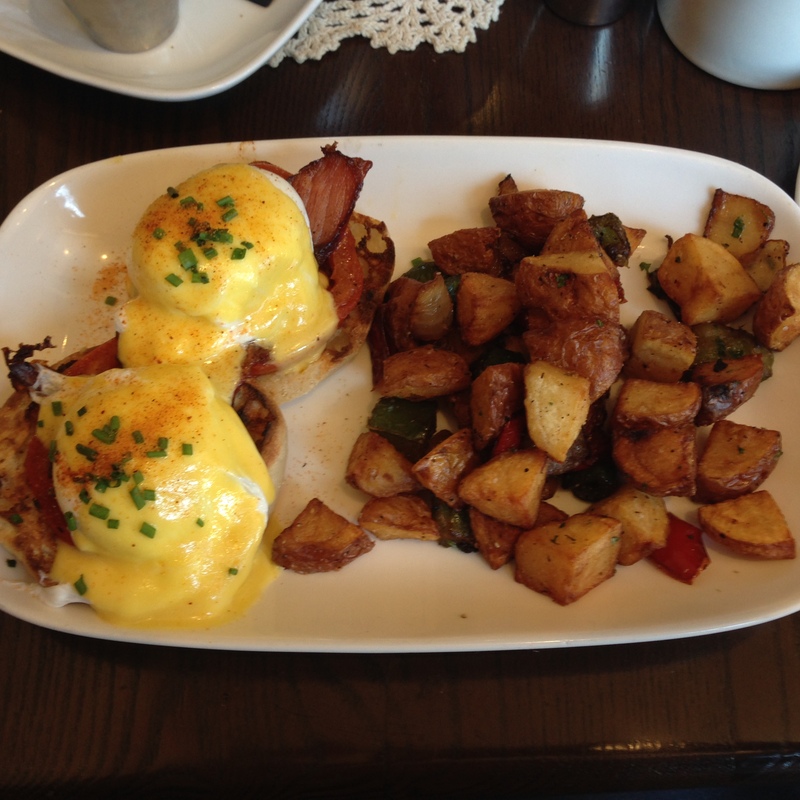 The Cajun Benedict had just the right amount of spice with the spicy Tasso ham, roasted tomato and cayenne pepper in the hollandaise sauce. The potatoes, despite that they cooked in duck fat, were good, but nothing spectacular. Now, back to those French toast sticks. There were three so we split the last one as a dessert and made sure to use up all the butter! Overall, the experience, including the tastefully decorated bathrooms, with the aged blue paint and tools mounted on the wall, was lovely! We would definitely go back there again…perhaps to try the blueberry ricotta pancakes or the Gouda cheese grits-and another order of the French toast sticks please! PS – I wish I could take credit for that first pic – but I can’t. It’s from these folks. This entry was posted in Brunch, Detour, Yay! I'm a Fan!. Bookmark the permalink.